Now that Labor Day has come and gone, everyone should be back to school by now. I have been absent for much of the summer and not posted nearly as much as I had hoped to. I have been working on some projects which I hoped to have up by now, but are still in process. Working two jobs right now while trying to maintain some semblence of a personal life has left me precious little energy to work on Paleoaerie. But hopefully, that should end soon and I will be back to posting on a regular basis. In the meantime, there are some news and upcoming events I would like to share so you can put them on your calendar. I have received the audio for my talks at the Clinton Presidential Library. Unfortunately, the video was not successful. So as soon as I get the chance to sync the audio to the powerpoint, I will post it here. I have joined forces with TIES, the Teacher Institute for Evolutionary Science, sponsored by the Richard Dawkins Foundation for Reason and Science. They have a number of excellent resources on their webpage and will allow an improved opportunity to offer workshops on evolution to teachers and other interested parties. These workshops are designed by teachers for teachers and are aligned with the Next Generation Science Standards. If you are interested in a workshop, please either contact me or Bertha Vasquez, the TIES Director. You can also find them on Facebook and Twitter. I will be appearing at the Forest Heights STEM Academy in Little Rock on Friday, September 11, to discuss how the scientific method is really used by scientists. 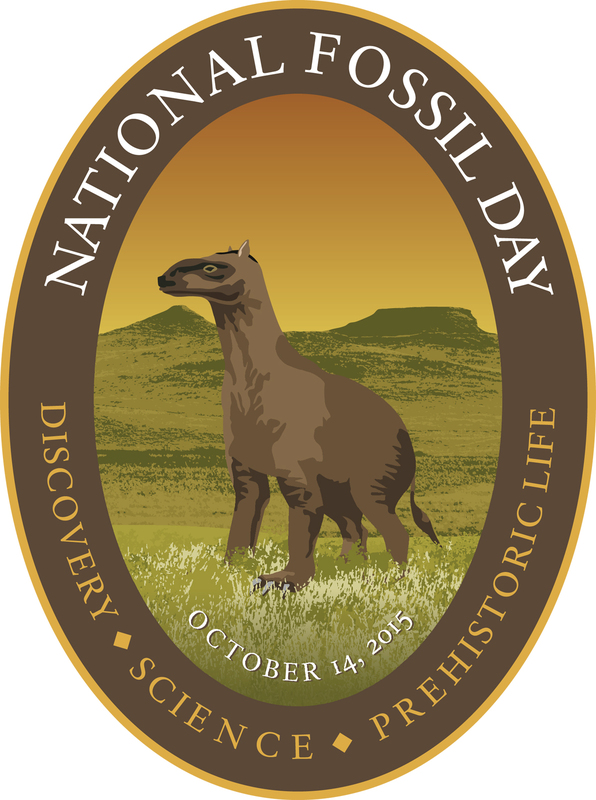 I will be appearing at the next quarterly meeting of the Arkansas STEM Coalition meeting on September 25 to talk about TIES and National Fossil Day. Now that all the business is out of the way, I will get on with more educational material. In honor of everyone going back to school, I thought I would start a few posts about some definitions that most people generally get wrong. Today, I am going to discuss a few of the types of scientists that study past life. Whenever a scientist tells people they are an archaeologist or paleontologist, they tend to brace themselves for the almost invariable questions about the other field. In most people’s minds, all the different sciences seem to be interchangeable, with little understanding that just because someone studies the past, they don’t necessarily study everything in the past. I won’t even get into the difference between scientists who study past life and historians. I will leave that for any archaeologists who wish to tackle that issue. I get this question so often that I bought this Tshirt. Even though we all study past life, there are important differences. Here is a Venn diagram I created that may help explain how they differ. 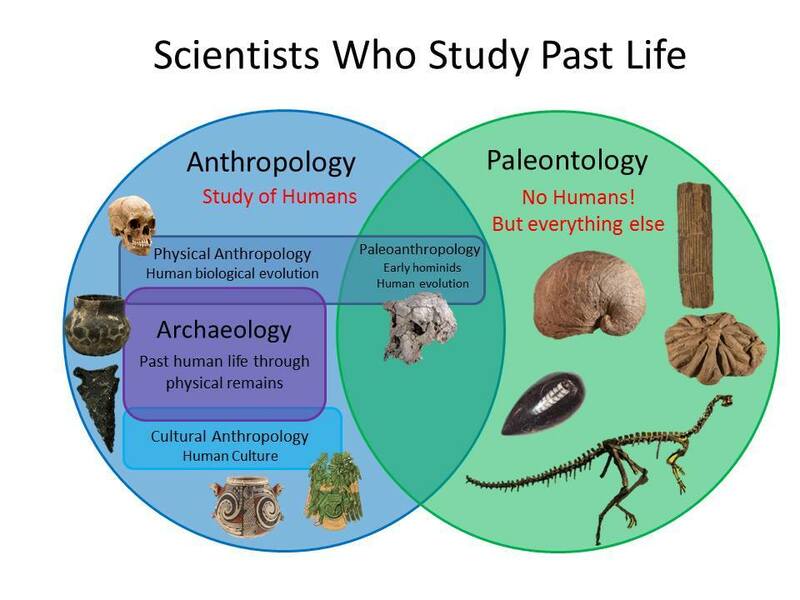 As you can see, there are two main divisions in scientists who study past life: those who study humans and those who study everything else. Anthropologists study humans, so don’t ask them about dinosaurs or mammoths or giant sharks. Don’t bring them a fossil you found. If you find a pottery shard or an arrow head, find an anthropologist. If you found a book, you might also try a historian. Ok, I said I wouldn’t get into this, but maybe just a little bit. Historians deal with written human history. So one might say that historians are a subset of anthropologists, in that they only deal with relatively recent anthropology. 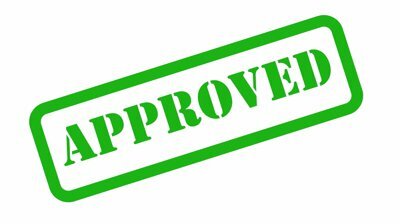 Many would also argue that they should not be included at all because they do not approach the endeavor with a scientific approach. While I can see the point, I can also see the point that this would also include many anthropologists, so comes across as sounding like the argument about can bloggers be considered journalists. The correct answer is that it is not as simple as that. But it’s not my field and my view of the topic is strictly as an outsider. 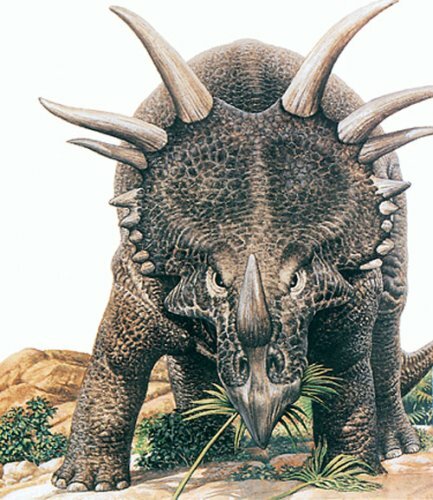 Paleontologists study everything that does not include humans. 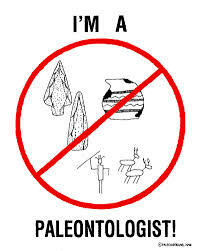 So please feel free to ask us about extinct organisms, as long as they don’t make pottery or arrow heads.This doesn’t mean to say that every paleontologist studies all extinct organisms. There are innumerable specialities within the field. If you ask a paleoclimatologist to identify a bone, he won’t have a clue what you are talking about. They study past climates, not bones. Just like one wouldn’t ask a podiatrist (foot doctor) to do brain surgery, don’t expect an expert in Pleistocene pollen to help you identify which type of trilobite you have, although I expect they could tell you that you do indeed have a trilobite. But what do you do if you find a fossil of a hominid, something not quite human, but not quite an ape? That is where paleoanthropologists come in. 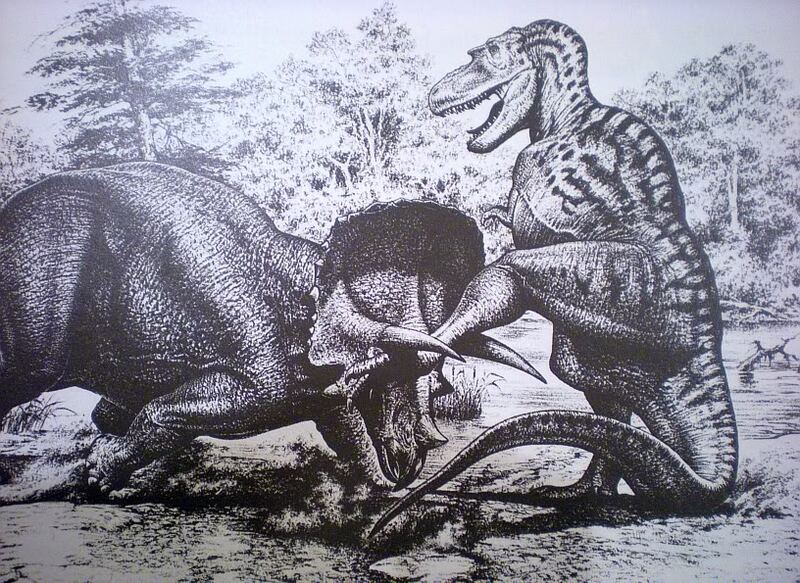 They deal with that intersection between paleontology and anthropology, where the lines blur into shades of grey. In point of fact, all these terms are arbitrary boundaries and only serve to help us break up the studies into something manageable. Like everything else in nature, we have taken a continuous spectrum and cut it into defined sections to satisfy our need to categorize everything. Even though there is far more life that is not human than there is that counts as human, for obvious reasons. The study of humans is more discussed than anything else. 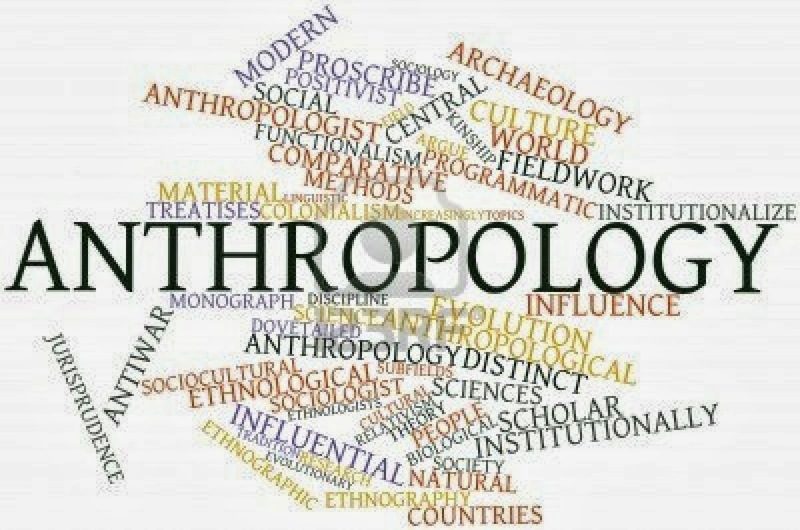 So while it is not my field, i will attempt to separate the major divisions within anthropology. Anthropologists, as mentioned study anything to do with humans. This can be broken down into two main categories. Physical anthropologists study the biology and evolution of humans. If you have human bones, they are the ones to talk to. Cultural anthropologists study human culture, their behaviors, what they make, how they interact with others. If it’s not a bone, but related to humans, ask a cultural anthropologist. But what then are archaeologists? Do they not do the same thing as anthropologists? Yes, because they are anthropologists. They are just a subset that happens to be so well known that many people lump archaeologists and anthropologists together as if they are the same thing. But they aren’t, not quite. All archaeologists are anthropologists, but not all anthropologists are archaeologists. Archaeologists study past human life through physical remains. Thus, they include some of both physical and cultural anthropology. They are the ones to talk to about pottery shards, arrow heads, and the like. Any physical evidence of a preexisting culture could be brought to the attention of an archaeologist. However, anthropologists cover a lot more ground, so to speak. There are cultural anthropologists that study current, existing culture. This is in fact a large field within cultural anthropology. There are even physical anthropologists that study evolutionary changes taking place within humans right now. Neither of these would count as archaeologists though. 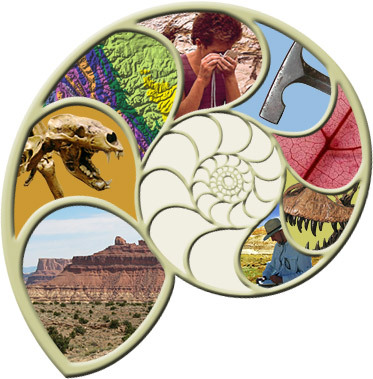 Just as in anthropology, as I mentioned earlier, there are several different subspecialties within paleontology. Here is how the University of California Museum of Paleontology breaks it down. Study of generally microscopic fossils, regardless of the group to which they belong. Paleobotany: Study of fossil plants; traditionally includes the study of fossil algae and fungi in addition to land plants. Palynology: Study of pollen and spores, both living and fossil, produced by land plants and protists. Invertebrate Paleontology: Study of invertebrate animal fossils, such as mollusks, echinoderms, and others. 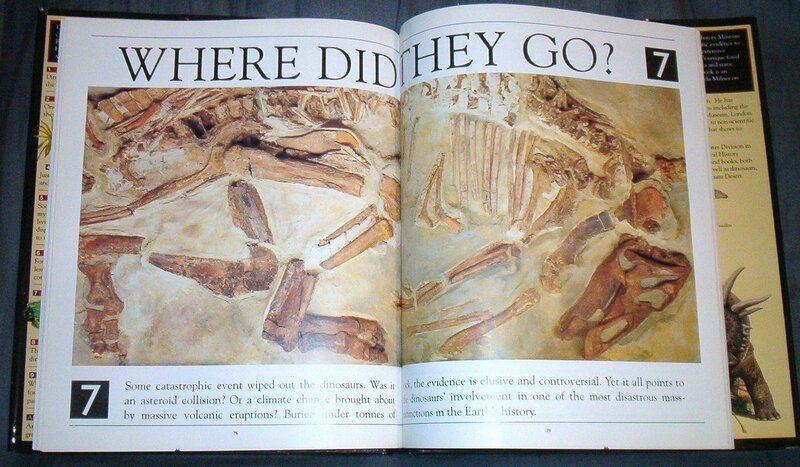 Taphonomy: Study of the processes of decay, preservation, and the formation of fossils in general. Ichnology: Study of fossil tracks, trails, and footprints. Paleoecology: Study of the ecology and climate of the past, as revealed both by fossils and by other methods. Each one of these can be broken down into even more specific specialties. Paleoecologists can specialize in biogeography, limnology, pedology, tempestology, schlerochronology,and many others. Vertebrate (and invertebrate) paleontologists can specialize in taxonomy, systematics, functional morphology, etc., but I think you get the point. There is far more that can be studied by any individual. paleontology, like any other science, is a team sport. There are no hard and fast boundaries between these of course. Vertebrate and invertebrate paleontologists can and do study taxonomy, biogeochemistry, paleoecology, and taphonomy, and others all at the same time. 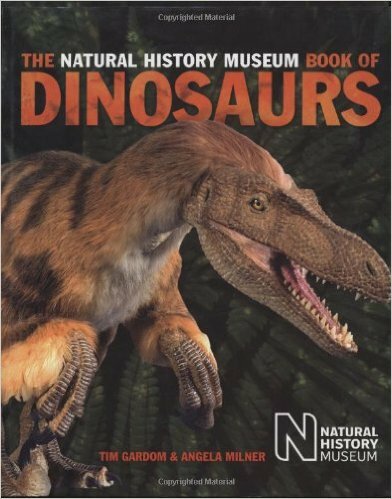 Paleontology is highly interdiscplinary and requires knowledge in a lot of different fields. But many scientists tend to spend most of their time in a specific area. So if you have a question, you will get the most detailed answers from someone in the right specialty. Choose wisely and you will get your questions answered. If you don’t, go to grad school, discover them for yourself and let everyone else know about it.